You will probably be well aware by now of a new European Union General Data Protection Regulation (GDPR) which is being introduced later this month. This is about your data protection and privacy. You have probably received several emails and letters from organisations and charities asking you to respond if you wish to continue to receive communication from them. If you don’t, they will no longer be able to contact you, legally. As the founder and director of a small Christian charity, Peacemaker Trust, www.peacemakers.ngoit has consumed a lot of time and energy to comply. But as the recipient of a large amount of junk mail, I think it is a positive step. We are fascinated when secrets are revealed in the media – except it seems when they are, our own. Those deeply personal things that matter the most to us – our children, our family, our bodies, our emails, our text messages, our age, our photos, our income, our bank accounts, we keep these private, and in many cases wisely so. The more important, the more personal, the more sensitive the information, the more likely, we will want to keep it private, confidential, or concealed. And many people feel the same way about their religious faith. Its personal. Its private. And it remains concealed. How ironic that Jesus commanded us to do the very opposite. And he sent his Holy Spirit to energise, empower and equip us to share him with others. On Easter Sunday we celebrated the birth of the Church.Today I would like us to consider the baptism of the Church under three headings: the context, the message and the experience of Pentecost. There is clearly an obvious parallel with the Tower of Babel. In Genesis when people tried to make a name for themselves and build a tower reaching to heaven, God cursed them by confusing their languages and scattering them across the earth (Genesis 11:1-9). On the Day of Pentecost people “from every nation under heaven” (Acts 2:5) came together in Jerusalem and were able to hear the same good news of “the wonderful works of God” in their own languages (Acts 2:11). At the cross of Jesus, the curse of the Tower of Babel has been removed. The good news of Jesus is for all peoples. He is building a church of all nations. The Tower of Babel. “Do and do, do and do, rule and rule” is Hebrew for gobbledygook – meaningless babbling like a baby. God had previously spoken plainly to his people through the prophets in Hebrew. Because the people rejected Jesus, Isaiah warns that God will speak to them in foreign languages. That is why the apostle Paul cites this passage from Isaiah in his letter to the Corinthians. He insists that unlike the other spiritual gifts which were given to build up the church, “Tongues, then, are a sign, not for believers but for unbelievers” (1 Corinthians 14:22).Pentecost was then a sign of great blessing but also of great judgment. One final parallel. Where were the Apostles on the Day of Pentecost? Somewhere a crowd made up of at least 15 nationalities and 3000 people could come together quickly on hearing them praising God. What time of day was it? 9:00am. Where would you find thousands of people at 9:00am in the morning? Remember this was their Harvest Festival. What happened at 9:00am? The Temple doors were opened at 9:00am. Morning prayers were offered in the Temple at 9:00am. Where did the Apostles pray? Acts 3:1 tells us “Peter and John were going up to the temple at the time of prayer—at three in the afternoon.”Where else would the Apostles be praying and waiting for the gift Jesus had promised? (Acts 1:4). The Apostles were very likely meeting in one of the courtyards of the temple praying like every other pious Jew at 9:00am on the Day of Pentecost. Remember God’s presence was symbolized by a cloud and fire, when he led the Israelites out of Egypt. Later, the pillar of cloud of God’s presence entered the Temple of Solomon (2 Chronicles 5:7-8, 13-14). The prophet Ezekiel records how the glory of the Lord filled the temple (Ezekiel 43:5). On the Day of Pentecost, God’s presence represented by the fire moved from the now redundant temple, whose curtain had been torn in two when Jesus died on the cross, and rested upon the “new temple,” the followers of Jesus (Romans 8:9). The parallels are clear then: The Tower of Babel. Mount Sinai. The foreign languages of Isaiah. The old and new temple in Jerusalem. This is the context for Pentecost. “Then Peter stood up with the Eleven, raised his voice and addressed the crowd: “Fellow Jews and all of you who live in Jerusalem, let me explain this to you; listen carefully to what I say.” (Acts 2:14). Some of the bystanders mocked the disciples suggesting they were drunk. They were not. They were perfectly sober, speaking about God in known languages. That is why Peter could not allow people to misunderstand Jesus or misrepresent the Holy Spirit. Peter’s sermon contains three parts: An introduction, the message and an application. Each of these parts carries a pronoun for its title. The introduction explains “This” (Acts 2:16); the message proclaims “Him” (Acts 2:23); and the application concerns “you” (Acts 2:36). He corrects their error. He convinces them of Jesus. He challenges them to make a decision. Correction: Conviction: Challenge. Here is a model for how to tell others about Jesus. Peter explains first of all that the manifestations they had witnessed were predicted by the prophet Joel and corroborated in Jesus Christ. When you love people you will want to correct their misunderstanding of what God is doing. He corrects their error from scripture. Peter did not speak about religion, a creed or about morality. Peter emphasizes the life of Jesus, his death, his resurrection, his ascension, the salvation he offers and the new community he is building. Peter spoke about a living person, God’s own Son and his saving work for the whole world. Jesus was both God and man, for He was the man “accredited by God”, a phrase indicating his deity. “But God raised him from the dead, freeing him from the agony of death, because it was impossible for death to keep its hold on him.” (Acts 2:24). In verses 24 and 32 Peter showed that the resurrection of Jesus was predicted in the Old Testament (2:25-28). As a result of Peter’s preaching about 3,000 people believerd and were baptised. Peter’s message consisted of just 520 words. There was no repetition, no waffle. It was directed to the mind, giving instruction; to the heart, producing enthusiasm; to the conscience, resulting in conviction; and to the will, leading to decision. 200 words – nearly half – are quotations from the Old Testament. Peter knew God’s word well enough to share it. Peter’s message was succinct, scriptural and Spirit-filled. That is the context and the message of Pentecost. But what of today? 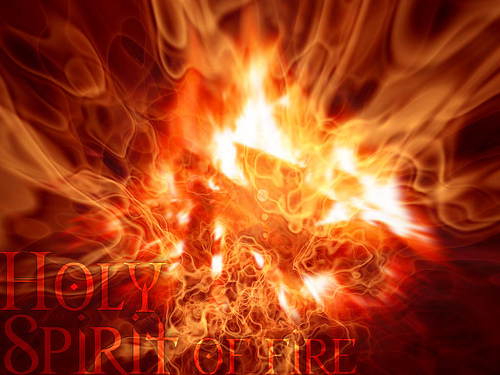 Why was the Holy Spirit given at Pentecost? As we heard in our Gospel reading, Jesus had explained before his ascension. The Holy Spirit was given primarily to make our witness for Jesus effective. We are His hands and feet, his ears and lips. The unquestionable emphasis of Pentecost is evangelism – the proclamation of the Gospel. The Holy Spirit was not given primarily to inspire worship but to impel evangelism. Notice it is universal “all” and past tense “were all” and synonymous with being given the one Holy Spirit. As we follow Jesus and confess our sins, God will keep on filling us with his Spirit. He will help us become more like Jesus and make our witness both fragrant and fruitful. Every week when we recite the Apostles Creed and say “I believe in the Holy Spirit…” we are really saying we believe in the Living God who willingly enters our human personality, heart, soul and mind, makes us more like Jesus, so that we can be his witnesses. Were the events of the Day of Pentecost unique? In the historical sense – yes, Pentecost was unrepeatable. But experientially, no. God the Father has made you, the Lord Jesus Christ died to save you, and the Holy Spirit breathes His life into you. He has a wonderful plan for your life. He used other people to bring you to himself and he wants to use you to lead others to himself too, by your words and actions. There is no greater privilege. He equips you with all His good gifts to do it. No matter how insignificant we may feel, empowered by His Spirit, we can have a life changing impact in the lives of others. Let us pray. This entry was posted in Sermons, Theology on May 21, 2018 by Stephen Sizer.